The secret tool to increase lifetime sales at travel agencies? Ideas for swag that will keep them boomeranging back. Everyone loves to travel. It’s no wonder why, as a recent study suggests that traveling makes people happier than purchasing material things. More people are ditching the shopping malls for beaches and resorts. Global travel contributed more than $5 trillion dollars to the world economy in 2018. If you are a travel agent, that means there is a lot of money up for grabs. For those of you looking to make your mark in the travel agency, it is a must that people remember you. There are so many travel agents that it is easy for you to get lost in the crowd. So how do you get people to remember? Branding is important. People will remember your brand by the first impression you make. How true this statement is! If you make a good first impression, people will use your services for life. Make a bad impression, they will associate your brand with a bad experience and let everyone know about it. As a travel agency, you want to make sure people remember you as a professional. There are so many agencies out there that it can be tough to stand out among your competitors. Using promotional products for the travel industry is a great way to make an impression and have people remember you. There is never a bad time to use a promotional product to have people remember you. However, there are three times that we recommend you must use them if you run a travel agency. The first of this is for outreach efforts to earn more business. This could be at trade shows or just giving things out around town to potential clients. The second is to have current clients remember who you are. Keep in mind that you are not the only travel agency in town and if a current client forgets your name, they could go online and shop around for someone else. The final time is as a thank you to customers after you make a sale. You can use things such as custom calendars and mark their travel dates inside. Or, give them something specific for their trip (e.g., sun umbrella for warmer climates). So, what are some of the most popular promotional items you can use to brand your travel agency? Travel accessories include items that people will use during their travel. They include travel pillows, alarms, and travel kits. Travel pillows come in several shapes, sizes and colors. You can get 3-piece pillows with blanket sets, neck pillows, and cuddle pillows. Regardless of the ones you choose, all can be customized with your company name or logo. These are great to give as gifts for those who have already purchased travel through your agency, especially when that travel involves long airplane rides. Make it easier for people to travel with a personalized travel kit. A personal charger kit is welcomed by all as charging your phone is a pain when on holiday. You can also choose personal care kits to hold shampoo and other items; or, pouches to hold your carry items while at the airport. Never let your clients travel internationally without a travel adapter. As you know, each country has its own electric code and plugins. What we use here in the United States will not work once you cross the border. A travel adapter is the only way to use your electronics without purchasing new cords for each one. It is also one of the most overlooked items to pack when traveling overseas. Travel adapters are carried by many local electronic and home improvement stores. However, they can be expensive if purchased individually at those locations. 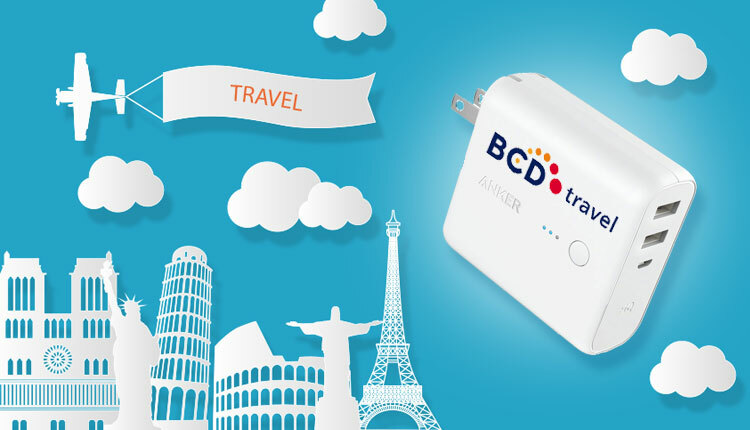 Our bulk purchase power allows us to pass our savings on to you so you can get a customized travel adapter at a great price. Imaging the look on your clients’ faces when they see you took the time to give them something they may have otherwise forgot to pack. What better way to have someone remember you than with a branded set of luggage? Personalize just about any size piece of luggage with your company name and logo. Choose from name brands such as Thule, TUMI, and Kenneth Cole. If you are looking for a travel bag but don’t want to go all out on luggage, consider a backpack. More and more people are ditching traditional bags for backpacks. They are small enough for carry-on at airports and easy to carry while walking in tourist areas. They have essentially become the modern-day fanny pack (which by the way, we have those too). A great accessory for any travel agent is a personalized calendar. Use these for any type of marketing before, during, or after a sale. Put desk calendars out in the office so people ask about them, use magnet calendars for people to see you each time they go to the fridge, and wall calendars to mark the dates of your clients’ travels. Giving wall calendars out to clients who have already purchased travel is a good way to keep you in their minds at least until they take their trip. They will hang it up in their house out of excitement for their vacation and it will also give you brand impressions for anyone who visits. You may not think of drinkware as a travel item, but you would be wrong. In fact, there are special types of drinkware especially for travel which will make someone’s trip easier (and they will remember you for it). Travel mugs can be used for those going on longer road trips. These mugs have spill proof tops and can be refilled and are easy to clean. Canteens are perfect for those trips to the mountains or national parks, while thermoses can also be used for camping adventures. For those traveling with children, sip-n-straw drinkware is perfect. Keep the car clean and free of spilled juice boxes with these easy to clean cups. Forget the paper business cards. While they are nice to have, you want to have a business card that people are sure NOT to throw away. Give them a USB flash drive customized as a business card. These business card sized drives can be imprinted with your company information so that clients remember you each time they use a computer. They can take it on their travel or simply let it remind them who you are when they are ready to book their next trip. People may throw away paper, but they will be less likely to discard a USB drive. In fact, they will be very appreciative of the gift which is a great way to make an impression and earn their business (or repeat business). If you want to opt out of purchasing a travel kit specific for charging, why not just purchase a portable charger? As stated, people are always looking to charge their devices and it can be a nightmare trying to find a place to plug in when on vacation. There are many different charging options to choose from including power banks, wireless chargers, and mophie power stations. Earbuds can also be a good promotional item for travel agencies. Clients who travel may want to block out the surrounding noise until they get to their destination. Why not be the person that made that happen? There are many more items you can use to brand your travel agency. Consider the options discussed earlier and think about how you can customize each of these for your agency’s needs. Pens (click pens, ballpoint, plastic, novelty, and twist action) – Use these in your office or just leave them in places like hotels, restaurants and business offices. Desk Accessories (business card holders, desk organizers, letter openers, etc.) – These are perfect items to give away to business professionals. They will use them regularly and you will get lasting impressions from each item. Journals – These are great for those who want to document their travels or even to make lists of items they will need for their vacation. Flashlights – Great for those going campaign or traveling by car. You never know when you will need a light. The possibilities are endless when it comes to using promotional products as a travel agent. It just takes a little imagination and knowledge of your client base. With all the things you can do to brand your agency, using promotional products is one of the most recommended. Brand impressions are important and promotional items help keep your name in front of people until they are ready to make a decision. Don’t let them forget who you are or they may just get to know your competitor instead. There are many products to choose from that will help you brand your travel agency. From travel accessories to luggage, there is always something within your budget that will suit any size agency. We also know that you may have a last-minute travel idea and need your promotional products rushed. That’s not a problem as we have a whole line of 24-hour rush products that are perfect for travel agencies. Still have questions? Call one of our promotional product specialists and let them take care of you the same way you take care of your clients.